Dan and Nadara sent me a tattered brown notebook from Aunt Margie’s keepsakes. With frayed pages and faded writing, this listing of household expenses, journal entries, and a few recipes dates from the 1860s and 70s. At the same time I was reading Laura Engalls Wilder’s Little House On The Prairie, a novel taking place at this time, to my granddaughters. While Wilder’s family traveled from Michigan to Missouri, my grandparents moved from Wisconsin to Colorado. Life for all these early pioneers was rustic. As Leslie and Alexis looked around their comfortable house with its state of the art kitchen and we read about cooking in a “spider” over an open fire, I asked them to imagine how early settlers might have baked a little cake or their cornbread. 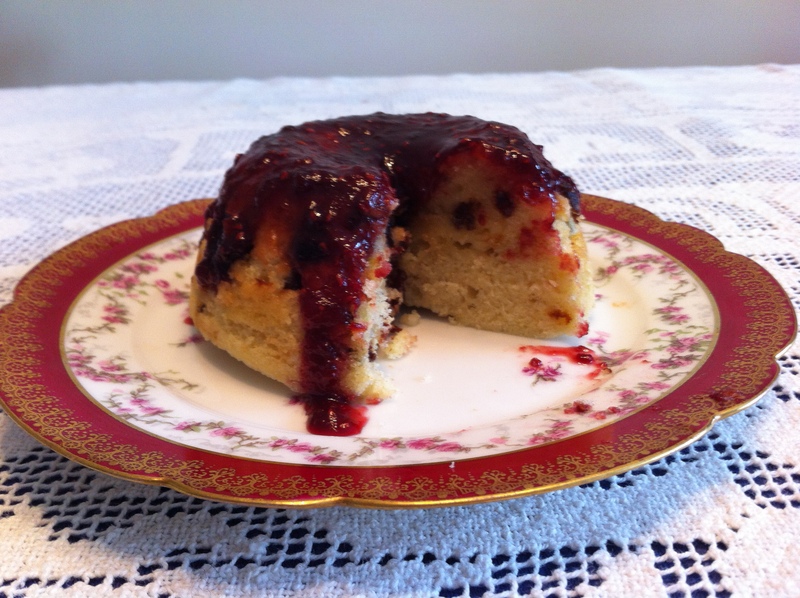 As the girls and I paged through the old booklet of nineteenth century accounts, we found a recipe for steamed cherry pudding. The next day I met them after school with a small cherry cake steamed inside a saucepan, and we had our answer. Based on the traditional Irish steamed jam pudding, this cake can bake in a saucepan on a quiet burner of the stove and provide a tender teacake or a warm winter dessert without heating up a big oven. The batter is simple enough for a child to mix, and although it takes an hour to slowly steam, the anticipation brings our pioneer history into today’s kitchen. *If using an extra large egg, subtract 1 tablespoon milk. Choose a pudding basin, a small soufflé dish, a glass beaker or Pyrex pint measuring cup, or a deep ovenproof soup bowl that will fit on a small rack inside a deep saucepan or Dutch oven. Butter the dish and line the bottom with a circle cut from a waxed paper butter-wrapper placed print-side down. Spread 2 tablespoons jam over the bottom and a little up the sides of the dish. Fill the saucepan with a quart of water and bring to a simmer. In a mixing bowl cream the soft butter with sugar, lemon peel and vanilla until fluffy. Add egg and beat vigorously with a whisk or beater. Sift over the flour, baking powder, salt, and mix. Blend in milk and beat again 10 seconds. Stir in dried fruit of choice and spoon batter into prepared mold. Smooth the top and cover with a piece of waxed paper or parchment, then clamp on a square of aluminum foil secured with a rubber band. Lower the ovenproof mold on to the rack or a saucer in the simmering water, cover and allow to steam at a gentle gurgle for an hour and 15 minutes. If using heavy pottery, cook the pudding 15 minutes longer. Remove from saucepan, lift off foil and paper and test for doneness. Loosen edge of cake and invert onto a serving dish. Peel off butter wrapper circle and glaze the cake with more warmed jam thinned with a little water if needed. Cool slightly before cutting into wedges and serve to 4 or 5 with whipped cream. Decades ago I stood beside Dolores as she slid tortillas in and out of hot lard before filling them with grated yellow Longhorn cheese and chopped white onion. Rolled and moistened with red chili gravy, plates of enchiladas reached her Formica family table alongside a bowl of soft pinto beans. “And be sure to eat pineapple for dessert after having a chili sauce,” she cautioned, as she brought in molded lime jello studded with cubed pineapple. And there ended the first lesson. Along Lazaro Cardenas street near the central market in Puerto Vallarta, a small sign reads Cenaduria Celia. The accordion doors don’t open until six in the evening when Señor Jorge walks out into the sidewalk beckoning passersby in for pozole or enchiladas. In the open kitchen, apron-clad women never miss a beat as the throng of locals and tourists alike pack the tables for traditional simple Mexican family suppers. There on a worn brown plastic plate I found the enchiladas of my expectations: memories fulfilled. Basically a way to use up stale tortillas, enchiladas, a staple of the Mexican corn kitchen, take on the guise of whatever filling and sauce may be at hand. They can be gluten free and vegan, filled with beans; vegetarian with cheese and spinach; or more typically filled with shredded beef, pork or chicken. In spite of what’s been said recently about simply softening the tortillas before filling, there’s no comparison in flavor or texture to tortillas that have been ever so lightly fried. Lard is the best, but even a few drops of olive oil will provide a remarkably tasty and chewy enchilada that will not dissolve into mush. First and foremost the tortillas must be corn—and stale. If you have fresh tortillas on hand, spread them out on the counter for an hour or so to dry out. Many recipes suggest dipping the tortillas in chili sauce and then the hot fat; however, if you don’t have a shallow wok-like Mexican two-bowled cooker, it’s more efficient to shallow-sauté tortillas and then dip them in the hot chili sauce just before filling and rolling. True enchiladas are not smothered in sauce and topped with molten cheese. In Mexico enchiladas will most likely be assembled at the last minute, surrounded with a thin chili gravy, and sprinkled with some Coteja cheese and cilantro. Tacos may now be America’s favorite fast food, but enchiladas are still best made at home. Wipe the chilis with a soft, dry cloth; remove stems, seeds and tear chilis into pieces (you should have a good cupful). Cover the chilis with boiling water in a small saucepan. Add onion, garlic and simmer for 15 minutes. Turn off heat and soak the chilis 15-30 minutes. Place the soft chilis and liquid in a blender, add more water if needed to puree easily. Push the liquid puree through a strainer to remove the chili skins. Heat l tablespoon lard or oil in a heavy saucepan; add cumin and when it is fragrant pour in the chili puree which may sputter. Stir and simmer the chili sauce for 20 minutes adding crushed oregano and salt to taste. Thin the sauce with water if necessary to make about 2½ cups of thin chili gravy. To make the enchiladas: heat 1 teaspoon lard or oil in a heavy frying pan and have nearby a shallow pan of hot chili sauce and the shredded meat mixed with chopped onion and half the cilantro. Fry the tortillas on both sides in the hot fat replenishing as needed. Dip the softened tortillas in the chili sauce and add a line of filling across the middle. Roll each tortilla and place 2 to four filled enchiladas on each plate. Ladle over the hot chili sauce, garnish with a sprinkling of Cojeta or Romano cheese and fresh Coriander. 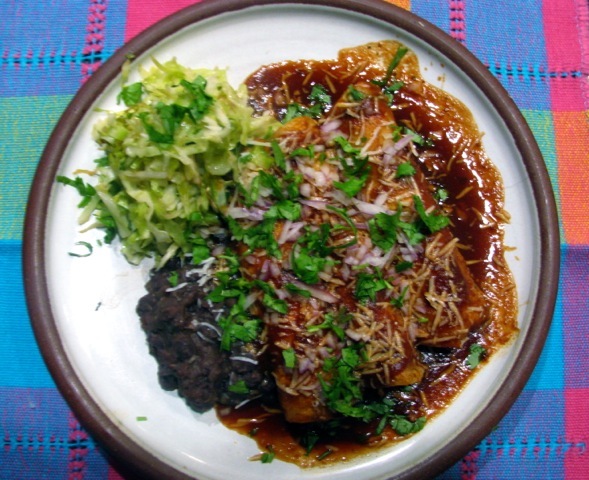 Serve with black beans and wilted cabbage for a traditional Mexican experience. You are currently browsing the Mary Jo's Kitchen blog archives for February, 2013.